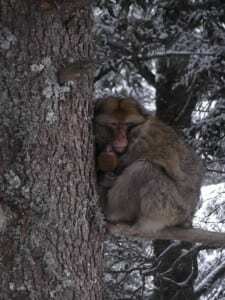 The endangered Barbary macaques have to cope with extreme environmental conditions, from cold and snowy winters to hot and dry summers. Under these extreme and diverse ecological conditions full-filling their daily energetic requirements may be very difficult for macaques. 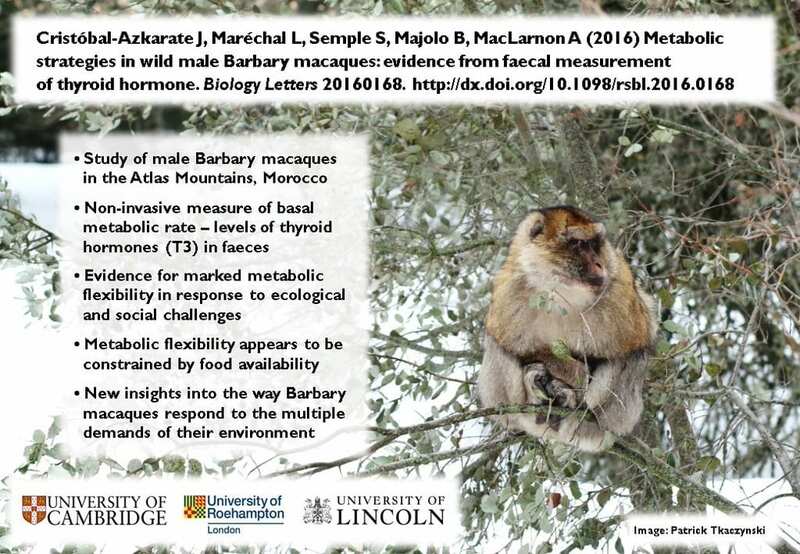 We have recently published a study that analyse the metabolic strategies of Barbary macaques in response to various ecological challenges. Below are the link to the paper and the graphical abstract. Cristóbal-Azkarate, J., Maréchal, L., Semple, S., Majolo, B., & MacLarnon, A. (2016). Metabolic strategies in wild male Barbary macaques: evidence from faecal measurement of thyroid hormone. Biology Letters, 12(4), 20160168. This entry was posted in Conservation, Publication and tagged Conservation, publication, research. Bookmark the permalink.